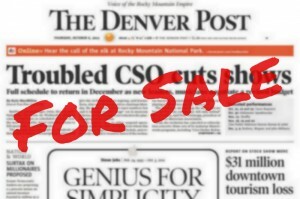 DENVER POST NEWSROOM Guild representatives and management met Feb. 23 in collective bargaining talks. We spent the entire meeting discussing what criteria should be used in the event of staff reductions. Previous sessions have focused on the concept of developing performance appraisals and how appraisal criteria could be dovetailed into some kind of ranking form used in the event of layoffs. During Thursday’s session the management team provided examples of performance appraisal forms used by the Bay Area News Group (and here’s a link to the Pacific Media Workers Guild). We will continue to consider performance appraisals. The Guild asked to broaden the discussion to explore a range of options on the bigger issue of how the company would handle layoffs. The management team is willing to talk through other options, but their stated goal remains the same: employees working at The Post after layoffs are the ones best able to do the remaining work — whatever that may be. We spent the remainder of Thursday’s meeting brainstorming other options. We are scheduled to meet again March 5. Feel free to leave your comments below or speak to any of the bargaining committee members. Please find performance reviews from media other than the Bay Area Newspapers. Gives me chills. I also do not have faith that the performance reviews can be handled appropriately. Agreed. I don’t think they would be willing to let the Guild challenge and dispose of some of the God-awful managers with which we have to deal. I don't know about you, but this stinks of targeting. Why in the world would we even consider it here? Why indeed are we discussing changing layoff language? The company has identified this as one of their top concerns – not just for our newsroom, but for the non-newsroom unit of the CWA as well as at other papers currently in negotiations. Of course the company likes the Bay Area language. It gives them great latitude. Please be aware that right now we are very much in the talking and idea stages of this negotiation. Nothing has been decided yet. It does us no harm to discuss options at this time. In fact, it is to our benefit. We get a better idea of what the company has in mind for the future of The Post when we approach bargaining openly. It also allows us to brainstorm and search for alternative options to issues without each side becoming locked into intractable positions. Will the newsroom be going through layoffs? It is impossible for me to say. We know the non-newsroom unit had some layoffs just this week. Depending on the decisions of our new corporate masters, we may be gaining or losing jobs in this newsroom. Depending how Thunderdome is implemented, we may be gaining or losing jobs in this newsroom. Depending on how our new contract is written, we may be gaining or losing jobs in this newsroom. I think we all agree that one thing is certain: this newsroom will continue to undergo changes. Please continue to use this website as a way to express your concerns and ideas. I also encourage all of you to ask your managers what they expect – both of you and for the company. If you get any insights from them, post something here. This sounds to me like we should be expecting lay offs no? I agree the idea of changing how people are lay offed just makes it sound like they want to be given carte blanche to choose whomever they want to fire. Performance based criteria seems ripe with subjectivity and would end up with people in departments being protected because they might get along better with their bosses. I am not saying that performance reviews are bad. On the contrary. I think it is great for both employee and boss to see how people are working and how they might improve. But not for a basis of firing people! Gee, it just really warms the soul doesn’t it, that the remaining newsroom employees of this paper – who are working so hard right now to keep a semblance of a quality paper, who have endured pay cuts, furloughs and longer work hours and responsibilities in the last few years – have a management whose ONLY goal right now, it would seem from these updates, is to figure out a way to get rid of them in as sneaky, underhanded way as they possibly can. What a way to build morale, Digital First! Why don’t you do us a favor then and skip the next phony pep talks down on the auditorium.